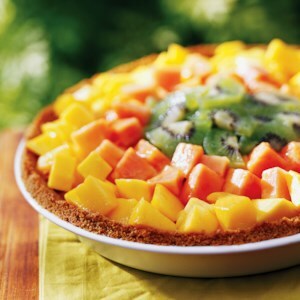 Find healthy, delicious papaya recipes, from the food and nutrition experts at EatingWell. 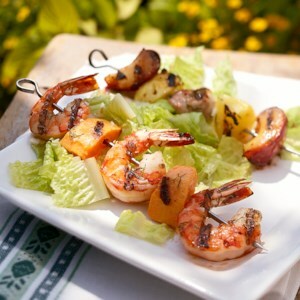 Add a little of the exotic to the everyday life; this salad fits the bill beautifully! 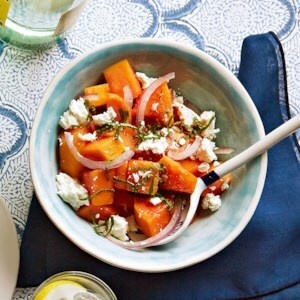 As odd as fruit with salty cheese might sound, this salad is amazingly refreshing and tasty. Try it with grilled fish, preferably at a table with a salty breeze and an ocean view on a hot summer day. 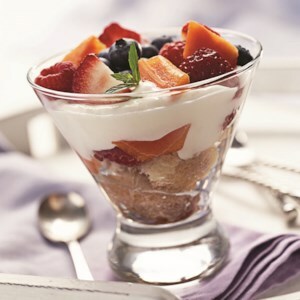 Ladyfinger cookies are piled into individual trifle dishes, then topped with orange liqueur, berries, papaya cubes, and a creamy, sweet dessert topping. A sprinkle of fresh mint adds the final touch. 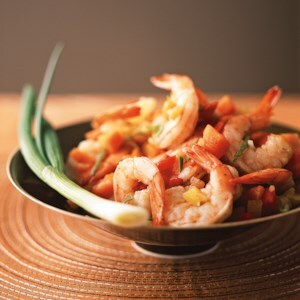 Shrimp marinated with Jamaican seasonings, papaya, pineapple, and red sweet peppers make a wonderful small bite or appetizer. 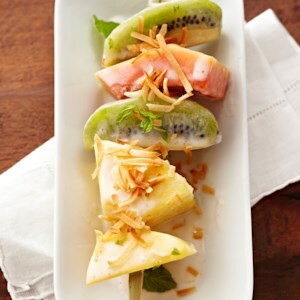 Tropical fruits are marinated in rich coconut milk and topped with mint and toasted coconut in this refreshing snack. 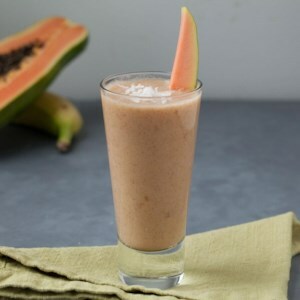 Whir up cantaloupe with papaya and mango for a creamy smoothie with a taste of the tropics. 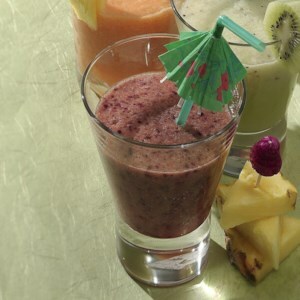 Tropical fruits combine with coconut milk in this healthy smoothie recipe that's like a vacation in a glass. 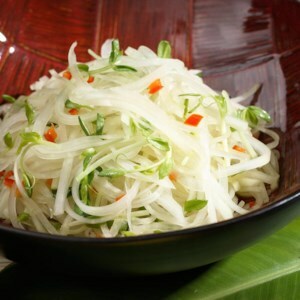 This Thai-inspired salad makes use of the papayas that grow throughout Hawaii. This version is tossed with tender, sweet pea shoots. Make an extra batch of the vinaigrette to keep on hand in the refrigerator--use it as a marinade for vegetables, a flavorful dressing for fresh melon or as a sauce to splash over grilled fish or chicken. 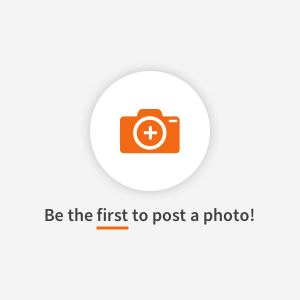 Lean boneless, skinless chicken breasts take a trip to Asia when tossed with unripe papaya, grated carrots, garlic, chile paste and cilantro. Wrap the salad in rice paper wrappers to make fresh spring rolls. Make it a meal: Iced Lychees are a cool finish to this Asian supper. 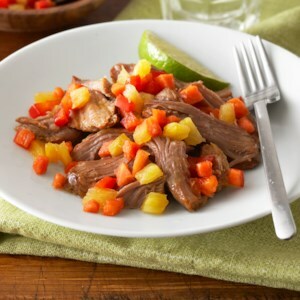 A colorful papaya relish served alongside grilled tuna makes a refreshing, healthy main dish. Make it a meal: Serve with Island Red Beans and brown rice. 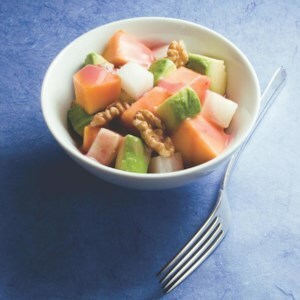 Crunchy jicama and walnuts pair with creamy papaya and avocado for an unusual salad. 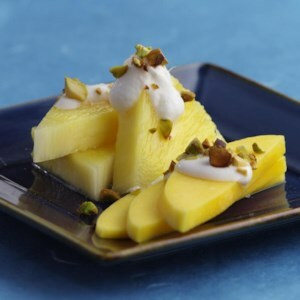 Luscious tropical fruit topped with creamy coconut milk and crunchy pistachios is a simple yet delicious dessert. 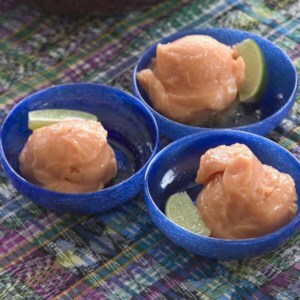 For the best taste and color, use a red-fleshed Hawaiian papaya for this exotic, lip-puckering taste of island summer. 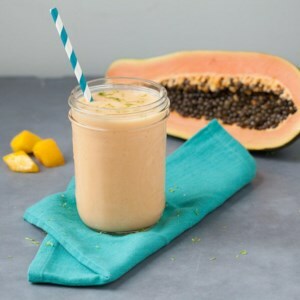 Papayas are loaded with papain, a digestive enzyme, so this smoothie is a good dessert to settle stomachs after a substantial meal. The relish is at its best served shortly after it is prepared. 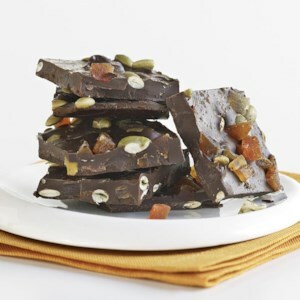 Chewy pineapple and papaya, tart lime and sweet coconut combine in an exotic fruit bar.